Define a rich Internet application (RIA). Understand key scenarios where RIAs would be used. Understand the components found in an RIA. Learn the design considerations for RIAs. Learn the guidelines for performance, security, and deployment of RIAs. Learn the key patterns and technology considerations for designing RIAs. Choose an RIA based on audience, rich interface, and ease of deployment. Consider designing an RIA when your vital audience is using a browser and operating system that supports RIAs. If part of your vital audience is on a non-RIA-supported browser, consider whether you can influence limiting browser choice to a supported version. If you cannot influence the browser choice, consider if the loss of audience is significant enough to require choosing another application type, such as a Web application using AJAX. With an RIA, the ease of deployment and maintenance is similar to that of a Web application, assuming that your clients have a reliable network connection. RIA implementations are well suited to Web-based scenarios where you need visualization beyond that provided by basic HTML. They are likely to have more consistent behavior and require less testing across the range of supported browsers when compared to Web applications that utilize advanced functions and code customizations. RIA implementations are also perfect for streaming-media applications. They are less suited to extremely complex multi-page user interfaces (UIs). Design to use a Web infrastructure utilizing services. RIA implementations require an infrastructure similar to Web applications. Communication to the business layer of your application is usually through services, which allows reuse of existing Web application infrastructure. Transferring logic to the client should only be considered later in the design process. Only transfer logic for performance optimization and UI responsiveness reasons. Design for running in the browser sandbox. RIA implementations have higher security by default and therefore may not have access to all devices on a machine, such as cameras and hardware video acceleration. Access to the local file system is limited. Local storage is available, but there is a maximum limit. Determine the complexity of your UI requirements. Consider the complexity of your UI. RIA implementations work best when using a single screen for all operations. They can be extended to multiple screens, but this requires extra code and screen-flow consideration. Users should be able to easily navigate or pause, and return to the appropriate point in a workflow, without restarting the whole process. For multi-page UIs, use deep-linking methods. Also, manipulate the Uniform Resource Locator (URL), the history list, and the browser’s back and forward buttons to avoid confusion as users navigate between screens. Use scenarios to increase application performance or responsiveness. List and examine the common application scenarios to decide how to intelligently divide and load modules, as well as how to cache or move business logic to the client. To reduce the download and start-up time for the application, intelligently segregate functionality into separate downloadable modules. Initially load only code stubs, which can lazy-load other modules. Consider moving or caching regularly used business layer processes on the client for maximum application performance. Design for scenarios where the plug-in is not installed. Because RIA implementations require a browser plug-in, a you should design for non-interruptive plug-in installation. Consider whether your clients have access to, have permission to, and will want to install the plug-in. Consider what control you have over the installation process. Plan for the scenario where users cannot install the plug-in, by displaying an informative error message, or by providing an alternative Web UI. RIA implementations provide the capability to move business processing to the client. Consider moving logic that improves the user experience or performance of the application as a whole. Consider starting with your business logic on the server exposed through services. Use scenario-based profiling to discover and target routines that cause the heaviest server load or have the most impact on UI responsiveness. Consider moving or caching only those routines to the client. When locating business logic on the client, consider putting business rules or routines in a separate assembly that the application can load and update independently. If your business logic is duplicated on the client and the server—for instance, if you are processing business rules on the client for performance but implement the same rules in the service for integrity—use the same code language on the client and server if your RIA implementation allows it. This will reduce any differences in language implementations and make it easier to be consistent in how rules are processed. If your RIA implementation allows creation of an instance without a UI, consider using it intelligently. You can keep your processing code in more structured, powerful, or familiar programming languages (such as C#) instead of using less flexible browser-supported languages. For security reasons, do not put highly sensitive unencrypted business logic on the client. RIA implementations generally use the normal browser caching mechanism. Caching resources intelligently will improve application performance. Cache components of your application for improved performance and fewer network round trips. Allow the browser to cache objects that are not likely to change during a session. Utilize specific RIA local storage for information that changes during a session, or which should persist between sessions. Use installation, updates, and user scenarios to derive intelligent ways to divide and load application modules. Load stubs at start-up and then dynamically load additional functionality in the background. Consider using events to intelligently pre-load modules just before they may be required. To avoid unintended exceptions, check that isolated storage is large enough to contain the data you will write to it. Storage space does not increase automatically; you must ask the user to increase it. RIA implementations must use the asynchronous call model for services to avoid blocking browser processes. Cross-domain, protocol, and service-efficiency issues should be considered as part of your design. If your RIA implementation allows it, consider using threading for background operations. If you have long-running code, consider using a background thread or asynchronous execution to avoid blocking the UI thread. If you are authenticating through services, design your services to use a binding that your RIA implementation supports. Ensure that the RIA and the services it calls use compatible bindings that include security information. If your RIA client must access a server other than the one from which it was downloaded, ensure that you use a cross-domain configuration mechanism to permit access to the other servers/domains. Consider using sockets to push data to the client if client polling causes heavy server load. Consider using sockets to push information to the server when this is significantly more efficient than using services; for example, real-time multi-player gaming scenarios utilizing a central server. RIA implementations usually have their own native controls. You can often mix RIA-based and non-RIA-based controls in the same UI, but extra communication code may be required. Use native RIA controls where possible. If the appropriate control is not supplied with your RIA package, consider third-party RIA-specific controls. If a native RIA control is not available, consider using a windowless RIA control in combination with an HTML or Windows Forms control that does have the necessary functionality. If your RIA controls support the ability to attach added behaviors, use that ability and avoid sub-classing the controls to extend functionality. Composition allows you to implement highly dynamic UIs that you can maintain without changes to the code or redeployment of the application. You can compose an application using RIA and non-RIA components. Evaluate which composition model patterns best suit your scenario. If an interface must gather information from many disparate sources, and those sources are user-configurable or change frequently, consider using composition. When migrating an existing HTML application, consider mixing RIA and the existing HTML on the same page to reduce application reengineering. RIA implementations access data in a similar way to normal Web applications. They should request data from the Web server through services in the same way as an AJAX client. After data reaches the client, it can be cached to maximize performance. Use client-side processing to minimize the number of round trips to the server, and to provide a more responsive UI. Filter data at the server rather than at the client to reduce the amount of data that must be sent over the network. For operation-based applications, utilize services to access data. A good exception-management strategy is essential for correctly handling and recovering from errors in any application. In an RIA, you must consider asynchronous exceptions as well as exception coordination between the client and server code. Do not use exceptions to control business logic. Only catch internal exceptions that you can handle. For example, catch data conversion exceptions that can occur when trying to convert null values. Design an appropriate exception-propagation strategy. For example, allow exceptions to bubble up to boundary layers where they can be logged and transformed as necessary before passing them to the next layer. Design an approach for catching and handling unhandled exceptions. Unhandled exceptions in RIAs are passed to the browser. They will allow execution to continue after the user dismisses a browser error message. Provide a friendly error message for the user if possible. Stop program execution if continued execution would be harmful to the data integrity of the application or could mislead the user into thinking the application is still in a stable state. Design for both synchronous and asynchronous exceptions. Use try/catch blocks to trap exceptions in synchronous code. Put exception handling for asynchronous service calls in the separate handler designed specifically for such exceptions; for example, in Silverlight, this is the OnError handler. Logging for the purpose of debugging or auditing can be challenging in an RIA implementation. For example, access to the client file system is not available in Silverlight applications, and execution of the client and the server proceed asynchronously. Log files from a client user must be combined with server log files to gain a full picture of program execution. Consider the limitations of the logging component in the RIA implementation. Some RIA implementations log each user’s information in a separate file, perhaps in different locations on the disk. Determine a strategy to transfer client logs to the server for processing. Recombination of different users’ logs from the same machine may be necessary if troubleshooting a client machine–specific issue. If using isolated storage for logging, consider the maximum size limit and the requirement to ask the user for increases in storage capacity. Consider enabling logging and transferring logs to the server when exceptions are encountered. RIA implementations provide a much richer experience and better performance than ordinary Web applications. Research and utilize the built-in media capabilities of your RIA platform. Keep in mind the features that may not be available on the RIA platform compared to a stand-alone media player. Design to utilize streaming media and video in the browser instead of invoking a separate player utility. To increase performance, position media objects on whole pixels and present them in their native size. Use adaptive streaming in conjunction with RIA clients to gracefully and seamlessly handle varying bandwidth issues. Utilize the native vector graphics engine for the best drawing performance. If programming an extremely graphics-intensive application, find out if your RIA implementation provides hardware acceleration. If it does not, create a baseline for what is acceptable drawing performance. Consider a plan to reduce load on the graphics engine if it falls below acceptable limits. RIA implementations provide a much richer experience than an ordinary mobile application. Utilize the built-in media capabilities of the RIA platform you are using. When an RIA application needs to be distributed on a mobile client, research whether an RIA plug-in implementation is available for the device you want to support. Find out if the RIA plug-in has reduced functionality compared to non-mobile platforms. Attempt to start from a single or similar codebase. Branch code as required for specific devices. Re-examine UI layout and implementation for the smaller screen size. RIA applications work on mobile devices, but consider using different layout code on each type of device to reduce the impact of different screen sizes when designing for Microsoft Windows Mobile®. One of the main benefits of RIAs is the portability of compiled code between different browsers, operating systems, and platforms. Similarly, using a single source codebase, or similar codebases, reduces the time and cost of development and maintenance, while still providing platform flexibility. Design for the goal of “write once, run everywhere,” but be willing to fork code in cases where overall project complexity or feature tradeoffs dictate that you do so. If your audience will be running the RIA on multiple platforms, do not use features available only on one platform; for example, Windows Integrated Authentication. Design a solution based on standards that are portable across different clients. When possible, use richer development languages that are supported for both rich clients and RIAs. See the Technology considerations in this section for recommendations. Make full use of the native RIA code libraries. RIA applications work best when designed as one central interface. Multi-page UIs require that you consider how you will link between pages. Positioning of elements on a page can affect both the look and performance of your RIA application. To avoid anti-aliasing issues that can cause fuzziness in RIAs, snap UI components to whole pixels. Pay attention to centering and math-based positioning routines. Consider writing a routine that checks for fractional pixels and rounds them to the nearest whole pixel value. Trap the browser’s forward and back button events to avoid unintentional navigation away from your page. For multi-page UIs, use deep-linking methods to allow unique identification of and navigation to individual application pages. For multi-page UIs, consider the ability to manipulate the browser’s address text box content, history list, and back and forward buttons in order to implement normal Web page–like navigation. You can store application state on the client by using isolated storage if the state changes frequently. If application state is vital at start-up, synchronize the client state to the server. Store state on the client in isolated storage to persist it during and between sessions. Store the client state on the server if loss of state on the client would be catastrophic to the application’s function. Consider that isolated storage is deleted when the browser cache is cleared. Verify the stored state between the client and server at start-up, and intelligently handle the case when they are out of synchronization. Design for multiple concurrent sessions because you cannot prevent multiple RIA instances from initializing. Design either for concurrency in your state management, or to detect and prevent multiple sessions from corrupting application state. Validation must be performed using code on the client or through services located on the server. If you require more than trivial validation on the client, isolate validation logic in a separate downloadable assembly. This makes the rules easy to maintain. Use client-side validation to maximize the user experience, and server-side validation for security. Use isolated storage to hold client-specific validation rules. In general, assume that all client-controlled data is malicious. The server should re-validate all data sent to it. Design to validate input from all sources, such as the query string, cookies, and HTML controls. Design to constrain, reject, and sanitize data. Validate input for length, range, format, and type. For rules that require access to server resources, evaluate whether it is more efficient to use a single service call that performs validation on the server. If you have a large volume of client-side validation code that may change, consider locating it in a separate downloadable module so it can be easily replaced without downloading the entire RIA application again. Properly using the client-side processing power for an RIA is one significant way to maximize performance. Server-side optimizations similar to those used for Web applications are also a major factor. Cache components of your application for improved performance and fewer network round trips. Allow the browser to cache objects that are not likely to change during a session. Utilize specific RIA local storage for information that changes during a session, or that should be persisted between sessions. Use installation, updates, and user scenarios to derive intelligent ways to divide and load application modules. Load stubs at start-up and then dynamically load additional functionality in the background. Consider using events to intelligently pre-load modules just before they may be needed. For example, in a merchant application, wait to load checkout functionality until sometime after a user has added an item to the shopping cart. Use scenario-based profiling to discover and target routines that cause the heaviest server load, or that have a major impact on UI responsiveness. Consider moving or caching these routines on the client. When locating business logic on the client, place business rules or routines in a separate assembly that the application can load and update independently. Position media objects on whole pixels and present them in their native size. Do not blend them with other objects, such as progress bar controls. Be aware of the size of your drawing areas. Only redraw parts of an area that are actually changing. Reduce overlapping regions when not necessary to reduce blending. Use profiling and debugging methods—for example, the “EnableRedrawRegions = true” setting in Silverlight—to see what areas are being redrawn. Note that certain effects, such as blurring, can cause every pixel in an area to be redrawn. Windowless and transparent controls can also cause unintended redrawing and blending. RIA applications mitigate a variety of common attack vectors because they run inside a sandbox in the browser. Access to most local resources is limited or restricted, which minimizes opportunities for attacks on the RIA and the client platform on which it runs. Applications run inside a sandbox in the browser, within a memory space isolated from other applications. Browsing of the local client file system is restricted. Access to specialized local devices such as Webcams may be limited or not available. The isolated storage mechanism provides a method for storing data locally, but does not provide built-in security. Do not store sensitive data locally unless it is encrypted using the platform encryption routines. Create an exception-management strategy to prevent exposure of sensitive information through unhandled exceptions. Be careful when downloading sensitive business logic used on the client because tools are available that can extract the logic contained in downloaded XAML Browser Application (XBAP) files. Implement sensitive business logic using Web services. If the logic must be on the client for performance reasons, research and utilize any available obfuscation methods. To minimize the amount of time that sensitive data is available on the client, utilize dynamic loading of resources and overwrite or clear components containing sensitive data from the browser cache. RIA implementations provide many of the same benefits as Web applications in terms of deployment and maintainability. Design your RIA as separate modules that can be downloaded individually and cached to allow replacement of one module instead of the whole application. Version your application and components so that you can detect the versions that clients are running. Consider how you will manage the scenario where the RIA browser plug-in is not installed. Consider how you will redeploy modules when the application instance is still running on a client. Divide the application into logical modules that can be cached separately, and that can be replaced easily without requiring the user to download the entire application again. Intranet. If available, use application distribution software or the Group Policy feature of the Microsoft Active Directory® directory service to pre-install the plug-in on each computer in the organization. Alternatively, consider using Windows Update, where Silverlight is an optional component. Finally, consider manual installation through the browser, which requires the user to have Administrator privileges on the client machine. Internet. Users must install the plug-in manually, so you should provide a link to the appropriate location to download the latest plug in. For Windows users, Windows Update provides the plug-in as an optional component. Plug-in updates. In general, updates to the plug-in take into account backward compatibility. You may target a particular plug-in version, but consider implementing a plan to verify your application’s functionality on new versions of the browser plug-in as they become available. For intranet scenarios, distribute a new plug-in after testing your application. In Internet scenarios, assume that automatic plug-in updates will occur. Test your application using the plug-in beta to ensure a smooth user transition when the plug-in is released. Because RIA implementations move presentation logic to the client, a distributed architecture is the most likely scenario for deployment. In a distributed RIA deployment, the presentation logic is on the client and the business and data layers reside on the Web server or application server. Typically, you will have your business and data access layers on the same server, as shown in Figure 2. If your applications are large, factor in the processing requirements for downloading the RIA components to clients. If your business logic is shared by other applications, consider using distributed deployment. If you use sockets in your application and you are not using port 80, consider which ports you must open in your firewall. Ensure that you use a crossdomain.xml file so that RIA clients can access other domains where required. Design the presentation layer in such as way that it does not initiate, participate in, or vote on atomic transactions. Consider using a message-based interface for your business logic. When you deploy your application on multiple servers, you can use load balancing to distribute RIA client requests to different servers. This improves response times, increases resource utilization, and maximizes throughput. Figure 3 shows a load-balanced scenario. Avoid server affinity. Server affinity occurs when all requests from a particular client must be handled by the same server. It is most often introduced by using locally updatable caches or in-process or local session state stores. Consider storing all state on the client and designing stateless business components. Consider using network load balancing software to implement redirection of requests to the servers in an application farm. Consider using a Web farm that distributes requests from RIA clients to multiple servers. A Web farm allows you to scale out your application, and reduces the impact of hardware failures. You can use either load balancing or clustering solutions to add more servers for your application. Consider using clustering to reduce the impact of hardware failures. Consider partitioning your database across multiple database servers if your application has high I/O requirements. If you must support server affinity, configure the Web farm to route all requests for the same user to the same server. Do not use in-process session management in a Web farm unless you implement server affinity, because requests from the same user cannot be guaranteed to be routed to the same server otherwise. Use the out-of-process session service or a database server for this scenario. Key patterns are organized by the key categories detailed in the Rich Internet Applications Frame in the following table. Consider using these patterns when making design decisions for each category. Application Controller. An object that contains all of the flow logic and is used by other Controllers that work with a Model and display the appropriate View. Asynchronous Callback. Execute long-running tasks on a separate thread that executes in the background, and provide a function for the thread to call back into when the task is complete. Chain of Responsibility. Avoid coupling the sender of a request to its receiver by giving more than one object a chance to handle the request. Command. Encapsulate request processing in a separate command object that exposes a common execution interface. Composite View. Combine individual views into a composite view. Inversion of Control. Populate any dependencies of objects on other objects or components that must be fulfilled before the object can be used by the client application. Model-View-Controller. Separate the UI code into three separate units; Model (data), View (interface), and Presenter (processing logic), with a focus on the View. Two variations on this pattern include Passive View and Supervising Controller, which define how the View interacts with the Model. Page Cache. Improve the response time for dynamic Web pages that are accessed frequently, but that change less often and consume a large amount of system resources to construct. Service Layer. 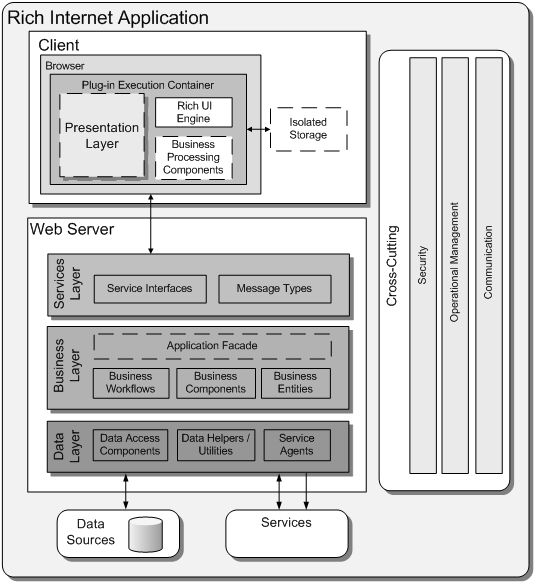 An architectural design pattern where the service interface and implementation is grouped into a single layer. At the time of this guide’s release, Silverlight for Mobile was an announced product and in development, but not released. Silverlight currently supports the Safari, Firefox, and Microsoft Internet Explorer browsers though a plug-in. Through these browsers, Silverlight 2.0 currently supports Mac, Linux, and Microsoft Windows®. Support for Windows Mobile was also announced in 2008. The local storage mechanism for Silverlight is named “Isolated Storage.” The current initial size is 1 megabyte (MB). The maximum storage size is unlimited. Silverlight requires that you ask the user to increase the storage size. Silverlight only supports Basic HTTP binding. WCF in .NET 3.5 supports Basic HTTP binding, but security is not turned on by default. Be sure to turn on at least transport security to secure your service communications. Silverlight does not obfuscate modules downloaded as XBAPs. XBAPs can be decompiled and the programming logic extracted. The .NET cryptography APIs are available in Silverlight and should be utilized when storing and communicating sensitive data to the server if not already encrypted using another mechanism. Silverlight contains controls specifically designed for it. Third parties are likely to have additional control packages available. Use Silverlight windowless controls if you want to overlay viewable HTML content and controls on top of a Silverlight application. If you want to provide rich control functionality in cases when WPF is not available (such as when Microsoft .NET Framework 3.5 is not installed on the machine), you can embed a Silverlight application in Windows Forms and run it in the Web Browser control. Silverlight allows you to attach additional behaviors to existing control implementations. Use this approach instead of attempting to subclass a control. Silverlight supports only asynchronous calls to Web services. Silverlight calls use the 'OnError' event handler for an application when exceptions occur in services, or when synchronous exceptions are not handled. Silverlight does not currently support SOAP faults exposed by services due to the browser security model. Services must return exceptions to the client through a different mechanism. Silverlight supports two file formats to deal with calling services cross-domain. You can use either a ClientAccessPolicy.xml file specific to Silverlight, or a CrossDomain.xml file compatible with Adobe Flash. Place the file in the root of the server(s) to which your Silverlight client needs access. In Silverlight, you must implement custom code for input and data validation. Check documentation to verify whether this is true for later versions. Silverlight performs anti-aliasing for all UI components, so consider the recommendations in the Presentation section about snapping UI elements to whole pixels. Consider using ADO.NET Data Services in a Silverlight application if large amounts of data must be transferred from the server. Silverlight logs to an individual file in the user store for a specific logged-in user. It cannot log to one file for the whole machine. Silverlight supports the languages of C#, Iron Python, Iron Ruby, and VB.NET. Most XAML code will also run in both WPF and Silverlight hosts. This page was last modified 23:45, 26 January 2010. This page has been accessed 10,613 times.